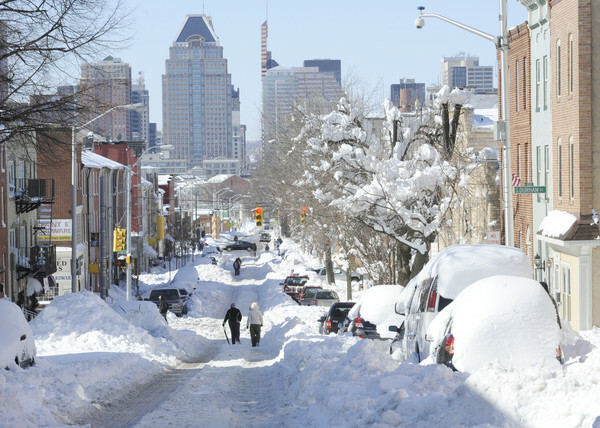 Winter can be a beautiful time of the year, but it can also be a very dangerous time too. Here are a few tips to make this winter safe. Always fill the gasoline tank before a long trip or even for a short distance. Stop to fill-up long before the tank begins to run low. Keeping your tank as full as possible will minimize condensation, providing the maximum advantage in case of trouble. A cellular phone can be very useful to you or another stranded motorist in case of an emergency. Clear all windows and lights of frost and snow. Also include road flares, a blanket, heavy boots, warm clothing, and flashlight with batteries. Remember to reverse the batteries in the case to avoid accidental switching, and burnout. Warm the batteries between your legs before using them. Pay attention don’t try to out drive the conditions. Remember the posted speed limits are for dry pavement. Know the current road conditions. Exit ramps are an even greater challenge during the winter since they may have received less anti-icing material than the main line. Be aware of this when exiting the highway. Don’t use the “cruise control” option driving in wintry conditions. Even roads that appear clear can have sudden slippery spots and the slightest touch of your brakes to deactivate the cruise control can cause you to lose control of your vehicle. Don’t get overconfident in your 4×4 vehicle. Remember that, if you are driving a four wheel drive vehicle, the vehicle may help you get going quicker but it won’t help you stop any quicker. Many 4×4 vehicles are heavier than passenger vehicles and actually may take longer to stop. Don’t get overconfident in your 4×4 vehicle’s traction. Look further ahead in traffic than you normally do. Actions by cars and trucks will alert you quicker to problems and give you a split-second extra time to react safely. Most importantly please remember to SLOW DOWN! Also, seat belts should be worn at all times – it’s the law. Remember that the road in front of the plow is usually in much worse condition than the roadway behind the plow. Plows will typically travel under 35 miles per hour and there is always a temptation to pass them. For your safety, it is recommended that you stay a safe distance behind the snowplows. During plowing operations, visibility can be reduced by blowing snow and plow operators may need time to stop or move over to avoid stranded vehicles. Keeping a safe distance between your vehicle and the plow is very important in order to avoid accidents. 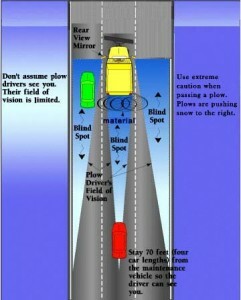 Allow plenty of room when passing a snowplow. Do not cut back into the lane ahead of the plow too quickly since the blade extends several feet ahead of the truck. Some snowplows are equipped with a “wing plow,” a 10-12 foot extension off the side of the truck. Be aware that the hazard exists. When you see an approaching snow plow on an undivided roadway, move as far away from the center line as you safely can since blowing snow may obscure the actual width of the snowplow’s blade. Turn on your lights- to see and be seen. Brush the snow off your headlights and taillights frequently. Winter driving requires motorists to be careful and alert, but the most important tip for winter driving is: SLOW DOWN!